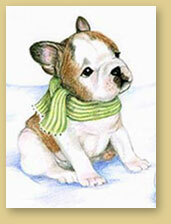 Enjoy sharing your love of Frenchies in the notes and cards you send? I have the perfect selection of blank notecards, holiday cards, and a few surprises ... all guaranteed to elicit a smile from the recipient. You can now find it all in my Etsy shop. (JBalsamFrenchieArt) Yup - we've moved!